Christmas Toilet Paper Designer Toilet Tissues for the Tush! 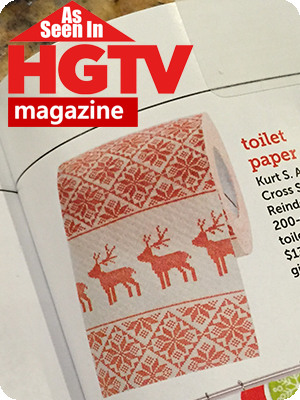 Printed designer Christmas Toilet Paper in a variety of styles for any holiday tush. Christmas Design Novelty Toilet Paper. Great in the bathroom for holiday decorating! Makes a great stocking stuffer for the Kids and Adults Too! Our Designer Christmas Toilet Papers are Triple, 3 Ply, 200 Sheet Single Rolls in Accetate Gift Package and a bow and your good to go! If you haven't already picked up this issue, just FYI, its a must have! HGTV Magazine's December issue is jammed packed, as always, stuffed with all kinds of great holiday decorating ideas, holiday DIY projects, and filled with all kinds of fun items and resources for holiday decorating. Christmas Design Novelty Toilet Paper. Great Stocking Stuffer for the Kids and Adults Too! Christmas Stocking Stuffers Collection - Christmas Decorations and Holiday Accessories and Decor by Kurt Adler.